Elnard, the game which 7th Saga is “based on” (the wording from the credits, not my own), was by comparison a much easier game. 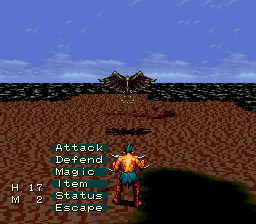 Most enemies had considerably lower stats. Although certain areas scaled up quite a bit, and some grinding is certainly still required, level-ups improved considerably later on – to the point where, at level 30, you would be gaining two or even three levels’ worth of stats – +3 points to each relevant stat – compared to what you would normally gain. For those that might be interested at this point, there is a patch out there that restores monster stats and does some initial leveling growth fixes. it doesn’t fully restore the leveling bonuses, though. So, on its own, 7th Saga isn’t Elnard – the original was, at its core, if not plot-driven (haha, with its 10 minutes of actual story), at least more exploration focused than 7th Saga. With the difficulty patch it becomes clear that exploration while leveling is not suicidal – far from it, it’s actually fairly easy to do! But wait, if 7th Saga may actually not be a terrible game fundamentally, what’s so great about it? What does it do that no other game* of its time and genre bothered with? 7th Saga introduced the concept of other “players” in the form of your rival apprentices. Although the core of the story is the same, each character has their own motivations. Not only do natural friendships form between characters with similar motivations – Esuna, Kamil, and Valsu, for example, who are predisposed to be friendly to one another – events over the course of the game will form a slightly different narrative each time. Since you can recruit one other apprentice to fight on your side, your party makeup will often differ – in my initial play-through, Lux joined me, but in my second, he refused to even consider it. For example, the castle town of Patrof is taken over by an apprentice gone rogue – the Rune it once guarded seized, and its townspeople living in fear – but which apprentice it is can differ from game to game, with certain limitations. Dialogue with the apprentice in question is always the same, but the characterwill be dead upon completion of the Patrof section of the game, and will never return. Another example – If you’re particularly brave, and join forces with a rival with totally different motivations (Valsu/Lejes, for example, the priest and demon characters), there’s even a chance that your companion will betray you and try to steal your runes. Finally, some sections of the game even differ based on your primary or companion character. Olvan, the dwarf, can go to his hometown and find out about a hidden passage in a secret cave (although other characters can find the cave, you must have Olvan in your party to pass to the final area). Lux and Esuna twice get ‘breaks’ in the form of free rides to certain places, while other characters have to pay money or go through dungeons. Before you get your hopes up, this isn’t a totally emergent experience. The order of runes, aside from a few which can be gotten in any order, will always be the same. 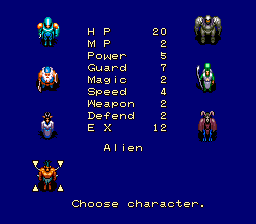 The dungeons will, with only a couple exceptions, come in exactly the same order for every character. The ending is the same no matter who you choose, and your companion character will never speak (unless he/she betrays you!). Even with all those caveats, 7th Saga actually has some really cool ideas – and, if characterization were especially good (like in, say, The Spirit Engine 2 which has a few ’emergent’ moments), such a narrative could be really powerful. In the 7th Saga, characters (and their reactions to you) do change slightly over the course of the game – however, tracking them down to figure out how they’re doing is not just tedious, it’s dangerous. By the halfway point, most characters will simply challenge you to a duel. And why not – you have the most runes! Imagine what a modern game could do with this concept, though – modern games like Space Rangers and Mount & Blade point at the same idea – give the player rivals – but go fully emergent in nature, with the narrative ultimately suffering (and most rivals being faceless by the end). When you factor in its sorta-post-apocalyptic lonely world, complete with demons, aliens, 30 or so 5,000-year-old amnesiac robots (okay, Tetsujin) wandering around (one of which is a primary character), you kind of see what kind of story 7th Saga was going for. It’s not typical, and this is absolutely a good thing. Oh, and of course it has good variety in music – four overworld themes, several totally distinct town themes, four battle themes. Not all of them are great, but I found them memorable. Decent games always have good music. Is 7th Saga worth playing? Maybe if the Elnard patch gets finalized, or if the player is dedicated enough to modify their save-states manually (*cough*). If one has enough free time, or a turbo button, the original might be okay. The game’s atmosphere may not totally be unique, but its 7-archetype-rivals system sets it apart enough for me. 7th Saga may not be worth playing, but in my book it’s worth thinking about. *Well, to say no game of its time built its narrative this way might be an overstatement. Inindo did this sort of thing – better mechanically, but worse in terms of story – when it built its strategy-game-in-the-background system, with dozens of adventurers wandering Japan at the same time. Too bad Inindo’s otherwise much less compelling! Yeah, I found such a mod and did make use of it, but it wasn’t sufficient. Maybe someday my ROM-fu will be good enough to create a complete fix (that restores the original Elnard difficulty). Haellujlah! I needed this-you’re my savior.